Augustine of Hippo (354-430) was the single most authoritative voice in the evolution of Christian theology after the books of Matthew, Mark, Luke, and John and the letters of Paul. His unique power derived from his special position in the early centuries of the church. He lived and wrote at the exact moment when the church was trying to define its beliefs for the general public. Up until 313, the church had been secret, hidden, underground. But with the publication of the Edict of Toleration in that year by Emperor Constantine, the church suddenly became public and was expected to state its beliefs publicly. Augustine, Ambrose and Jerome together formed this powerful new generation of church leaders who wrote for the church and led the church in the last years of the fourth century. 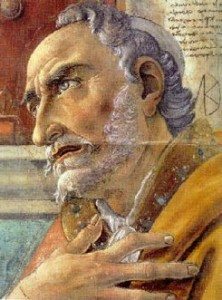 Augustine’s books and sermons were the most brilliant and influential of this generation. Constantine, Edict of Milan. Also called the Edict of Toleration. The Edict gives legal status to Christianity. Council of Nicaea: Nicaean Creed. Trinity orthodox, no to the Arian heresy. Build first basilican church of St Peters.Same site as present church. Constantine builds new capital, Constantinople. Picts & Scots cross Hadrian's Wall attack Roman Britain.Huns invade Europe. Ambrose elected Bishop of Milan. Milan now the most active Christian center in Italy. Roman legions begin to evacuate Britain. Signs of the Times. Bishop Ambrose introduces hymn singing. (Milan). Ambrose baptizes Augustine (see Aug's Confessions Bk V).You can visit the spot in the Cathedral of Milan. Emperor Theodosius divides empire into Eastern and Western halves. Permanent eclipse of Rome, Milan capital of Western Empire. Visigoths sack Rome. Worst sack ever. Most terrible calamity of all for Romans. A shaken Augustine writes The City of God. Tries to make sense of sack of Rome. Death of Augustine. Buried in Pavia in the church of San Pietro in Ciel d'Oro. Attila crosses the Rhine with 700,000 of his closest friends. Huns besiege Paris; St. Genevieve leads resistance. Death of last Roman Emperor in Rome. Now empire ruled from East. Benedict in Rome studying Law. Disgusted by corruption of Rome. Later Benedict founds western monasticism. Death of Boethius, translating all Plato & Aris into Latin. Dies before he can finish. Boethius buried in Pavia, San Pietro in Ciel d' Oro.Christian scholar Dionysius Exiguus introduces idea of dating B.C./A.D. Accession to imperial throne of Justinian. His rule ends with his death in 565. For a brief time he unifies the whole of the Eastern & Western Emp. Benedict founds the Benedictine monastic order.Founding house at Monte Cassino. Toledo capital of Visigothic kingdom of Spain. Lasts till the Moslem conquest in 711. King Arthur killed in Battle of Camlan . No documentary evidence for the date. Saint Apollinare in Classe, Ravenna. Last Supper appears in painting. Appearance of Crucifix as church ornament. Elect St. Germain bishop of Paris. Later he founds Benedictine monastery in Paris. Gregory Prefect of Rome.Highest civil post responsible to Constantinople. Birth of Mohammed, founder of Islam (died 632). Death of St. Germain. Buried in Parisian monastery named for him (des Prés). Gregory becomes Pope. St. Gregory the Great. Augustine begins the conversion of Eng to Roman Christianity.Baptizes King Ethelbert of Kent. Founds Canterbury (Benedictine). Isidore, Archbishop of Seville, writing his Etymologiae (Origins).Summary of all known knowledge at his time. 1,000 Medieval manuscripts survive. Consecrate the Pantheon as Christian church.Santa Maria in Rotonda. Lombards (Northern Italy) convert to Christianity. Pavia becomes their capital. Death of St Columban. Irish missionary to Europe. Arabs in Egypt find Library of Alexandria with 300,000 scrolls. End of Alexandria as center of Mediterranean learning, book production. First synod of the English Roman Catholic church, Synod held at Hertford. Synod of Whitby. Roman church triumphs in dispute with locals. Elect the first Doge of Venice. Paoluccio Anafesto. Death of Venerable Bede. English church historian, adopts B.C./A.D. Boniface leaves England. Brings Roman Catholic Christianity to Low Countries and GermanyMartyred in Holland in 754. Charles Martel (Franks) defeats Arab advance. Wins the Battle of Poitiers. This marks the furthest northern advance of the Arabs in Europe. Death of Charles Martel. Son Pepin the Short now leads the Franks. Pepin officially named King of the Franks. Rules France and Germany. HISTORIC ACCORD: Boniface arranges meeting, Pope-King Pepin. Pepin promises military help, protect Papal States from Lombards.Pope Stephen III promises consecrate Frankish dynasty (France/Ger).Triumph of policy is coronation of Charlemagne in Rome 800. Death of Pepin. Accession of son Charlemagne. Carolingian Renaissance. Charlemagne meets Alcuin at Pavia. Development of Venice. Build fortress, Doges palace. Treaty of Verdun. Divide Charlemagne empire among 3 grandsons. Paris sacked by the Northmen. (Normans). Alfred the Great, King of England, begin beat back Norsemen/Danes. Alfonso the Great of Castile begins reconquest of Spain from Arabs.Constantinople still the richest city in the world-commerce/culture. Papacy at its nadir, called Pornocracy, mistresses, mothers of popes. Henry Duke of Saxony elected King of the Germans. Begin success of House of Saxony.Son Otto becomes Holy Roman Emperor. Unite Germany monarchy with papacy. Otto comes to Italy marries Adelaide of Burgundy.Adelaide widow of Lothar, King of Italy. Otto becomes legitimate "king" of Italy & Germany. Otto and Adelaide dominate the second half of 10th Century. (Adelaid dies 999). Son Otto II, 973-983, Grandson Otto III, 983-1002. Pope John XXII crowns Otto/Adel. Holy Roman Emperor and Empress in Rome. Hugh Capet, King of the Franks. This ends Carolinian line, establishes new French line. Establishment of the Cathedral school of Chartres. Fulbert + Hugh Capet. King Robert II, King of France (to 1031, of Capetian line). King Henry I of France,. Successful reign to 1060 (stable France). Henry III (German) Holy Roman Emperor. Comes to Rome, great power. Formal permanent division between Eastern and Western Christian Church. Elect Bishop Gerhard of Florence as Pope Nicholas II. Leads church reform. Death of King Henry I of France. Son Philip I (Fat Philip) reigns 48 years. Begin Cathedral of Pisa. Pisa on the march. Elect Hildebrand Pope Gregory VII. Most important church reformer in 11th century. The Way to Canossa. Emperor waits in snow for Pope, Papal supremacy. Birth of Bernard of Clairvault (Cistercian Order, France). El Cid takes Valencia from the Moslems. (Moors). FIRST CRUSADE, The West on the march. See Wikipedia’s extensive article on Augustine.